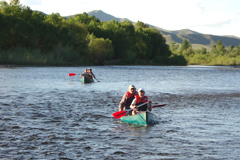 Canoeing is a unique way to get to know Mongolia. In the short hot summers life in the steppes concentrates on the riverbanks. Huge flocks of horses stampede out of the water as you draw near, the golden eagle is circling above looking for prey and all sorts of water fowl enliven the clear, fast flowing stream. From time to time a horseman will appear on a high bank or a bluff overlooking the river and wherever there´s abundant pasture you´ll glimpse the outline of a white yurt through the green bushes lining the river. If you stop you´re bound to get invited by a friendly herder and you will have ample opportunity to get to know a life style completely unlike any you have ever encountered before. It is another world with a completely different pace. 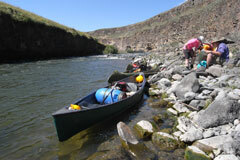 And travelling down Mongolia´s rivers you become part of it. Best time for canoeing is the from June until the end of August, but you might also consider September. Many regard it as the most beautiful time of year with almost continuous sunshine and Mongolian version of “Indian Summer”. Although you will be in a T-shirt most of the time, night temperatures already dip below freezing point and short cold spells and even snow are – although rare - possibility. 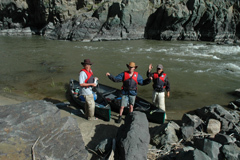 MongoliaCanoeing is the only tour company in Mongolia specializing in river tours. 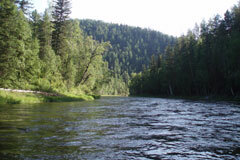 By now we have 14 years of experience touring all the major rivers of Mongolia. What you see on our web side are "only" what we believe are the best tours. But we do all other rivers as well. Just ask us. We also work together with select, quality tour companies in Mongolia. So if you are also interested in horse riding or a jeep tour, contact us and we can help you combine other ways of travelling with canoeing. This river near Ulaanbaatar is ideal for short trips from one to three days. You travel through pristine mountains and steppe right outside the capital. Starting in basalt canyon like out of fairy tale this fast-flowing river takes you through all the landscapes of Mongolia. Right in the heart of the Khan-Khentii national park near the capital UB, this river offers the ultimate wilderness experience. 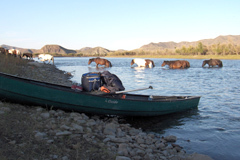 Rent boats on all the major rivers of Mongolia! All equipment and advise you might need at reasonable prices.